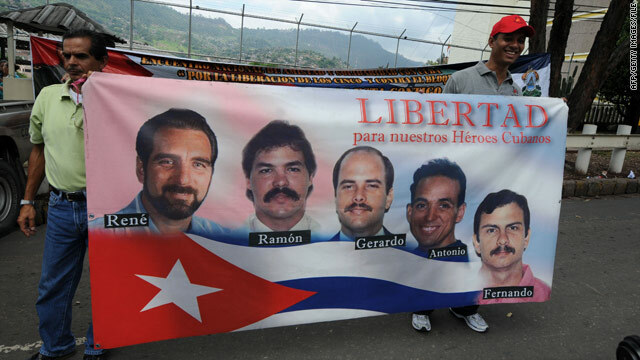 Rights group questions fairness of Cuban spy trial in U.S.
Cuba says the five men, known at home as "the five heroes," were sent to Miami to infiltrate violent exile groups. Amnesty International points to a "prejudicial impact of publicity"
Havana, Cuba (CNN) -- Amnesty International has questioned the fairness of a U.S. trial that convicted five Cuban agents of espionage, conspiracy to commit murder and other related charges. In a report issued earlier this week, the London-based human rights group described a "prejudicial impact of publicity," saying the anti-Castro community in south Florida may have created partiality during the trial that affected the convictions and subsequent appeals process. The rights group, while not commenting on the men's guilt or innocence, highlighted questions surrounding their pretrial detention, their access to attorneys and documents that "may have undermined their right to defence," the report said. Cuba says the five men, known at home as "the five heroes," were sent to Miami to infiltrate violent exile groups at a time when anti-Castro groups were bombing Cuban hotels. They were arrested in 1998. Their incarceration has drawn condemnation in Cuba and abroad. One of the five is serving a life sentence for allegedly helping Cuba shoot down two unarmed airplanes that were dropping leaflets over the island, killing the Cuban-American pilots. The five have acknowledged acting as unregistered Cuban agents assigned to report hostile activity from the Cuban exile community or visible signs of U.S. military actions against Cuba, but have denied efforts to breach U.S. national security, according to the Amnesty report. Last year, the defendants were denied an appeal when the U.S. Supreme Court refused to hear their case. The defense argued that a fair trial was impossible in a city dominated by anti-Castro politics. In a letter to U.S. Attorney General Eric Holder, Amnesty asked for closer examination of the circumstances surrounding the group's incarceration. Images of the men are plastered across billboards throughout Cuba. Their names are also commonly included in speeches given by Cuban officials during major political events. The report comes at a time when Cuba is in the process of releasing its largest batch of political prisoners in over a decade.